Pals, I’m very pleased to announce my first-ever photo exhibition at the venerable Origami Vinyl next month. We’re kicking things off with an opening night party on Friday, June 4, at 7 p.m., and as Travis Morrison once said, you are invited. 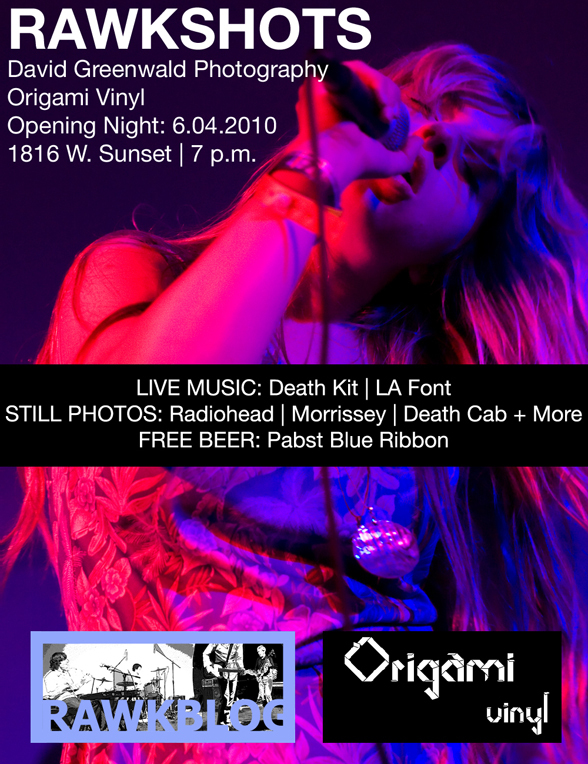 Rawkblog favorites Death Kit and LA Font will be playing live sets, limited-edition prints of my work will be on display (and for sale, signed and numbered by yrs truly) and we’ll have free beer until we run out of PBR. Come! You can RSVP on Facebook or walk right in.